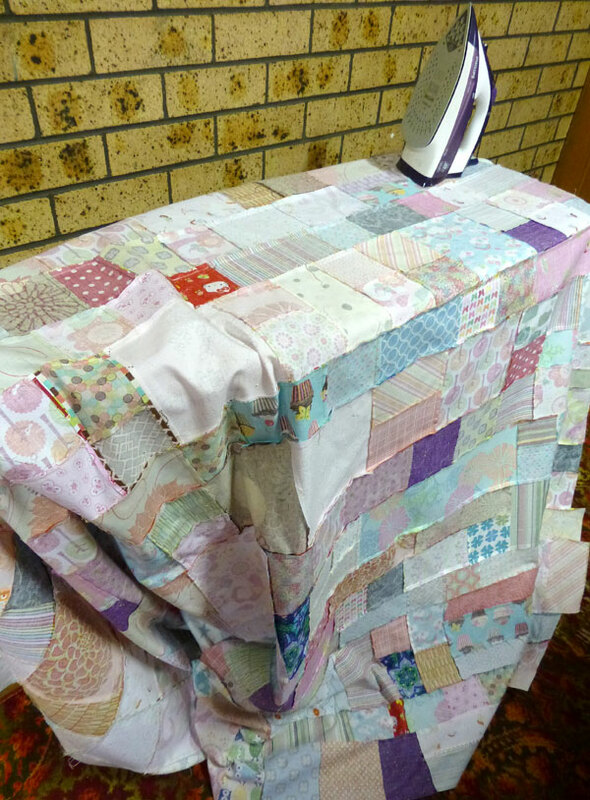 On my recent trip to Australia I attempted my first big sewing project. 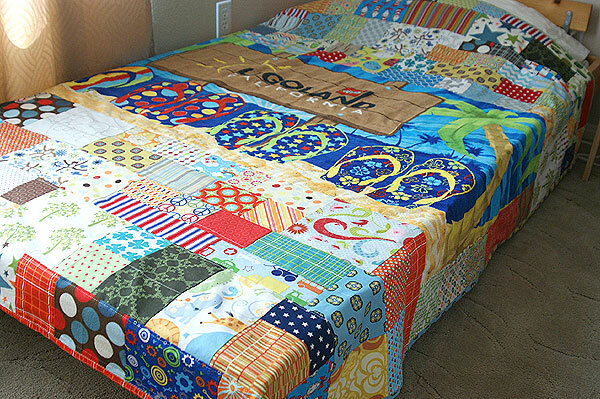 My goal was to make three patchwork bedspreads, one for my niece’s double bed and another two for each of my nephew’s single (twin) beds. I managed to complete 2 out of the 3, I still have to make the third one and send it over to my nephew (thank you for being patient Mathew!). 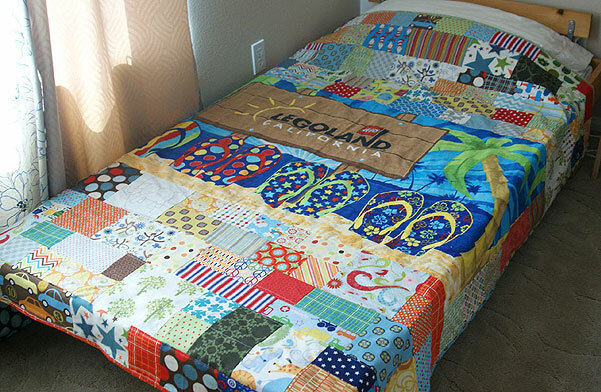 The finished size of the double bedspread measures roughly 74″ x 84″ (185 x 210cm) and the twin bedspread is about 74″ x 66″ (185 x 165cm) . 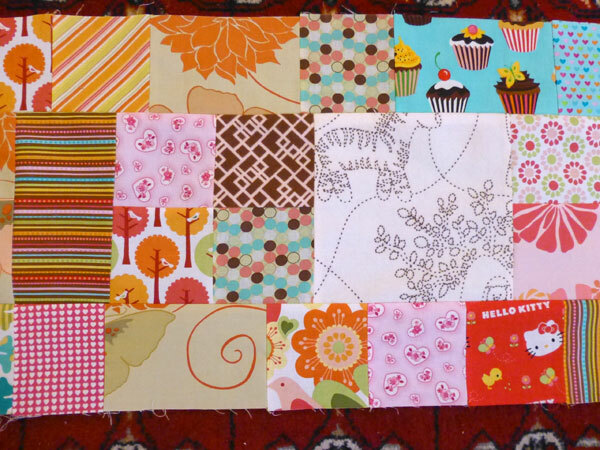 Before starting my niece’s double bedspread, I had envisioned a colourful patchwork of random squares and rectangles. I didn’t follow a pattern, made it up as I went along. 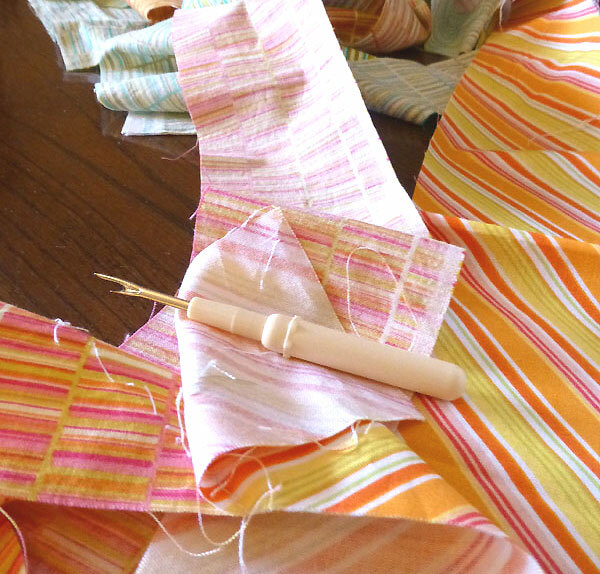 In hindsight I wish I had documented my steps and progress in more detail so that I could have it for future reference and the option to share the pattern or make it again without any guesswork. 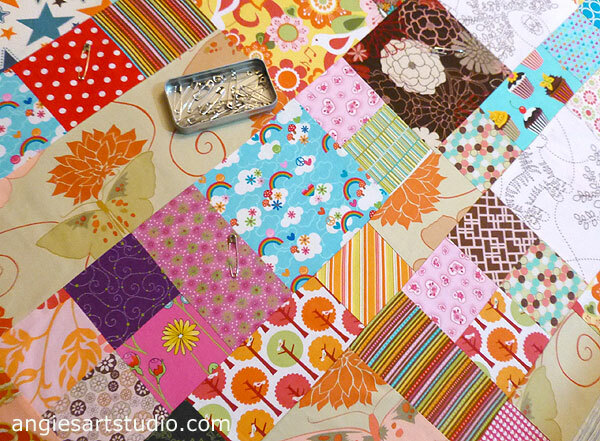 From memory I mainly used 4″ and 7.5″ squares and varying lengths for the rectangles. 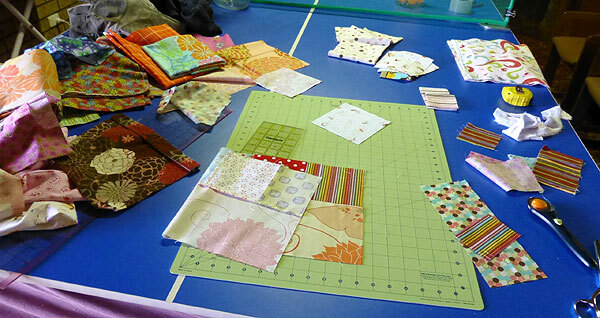 There was constant to and fro from the ping pong table that doubled as my cutting table and the sewing machine. 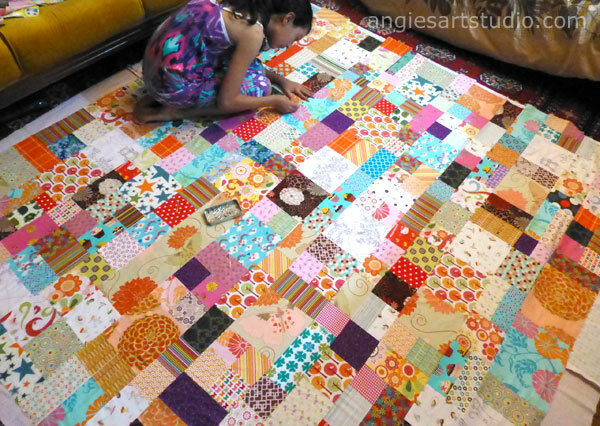 I pieced together each row until it measured over 84″ (excess is trimmed off later), ironed the back so that the seams were flat and then sewed each row together, adding on to each row until I reached my desired length of about 74″. Ironing is necessary, but is a pain. Need I say more? 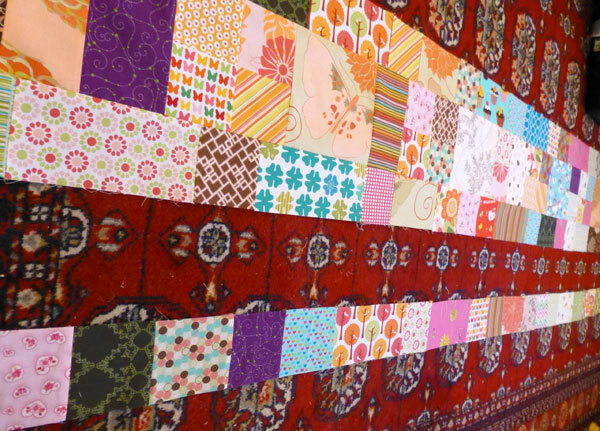 After pinning, I trimmed the excess backing that was showing and then quilted the two layers together before squaring off. 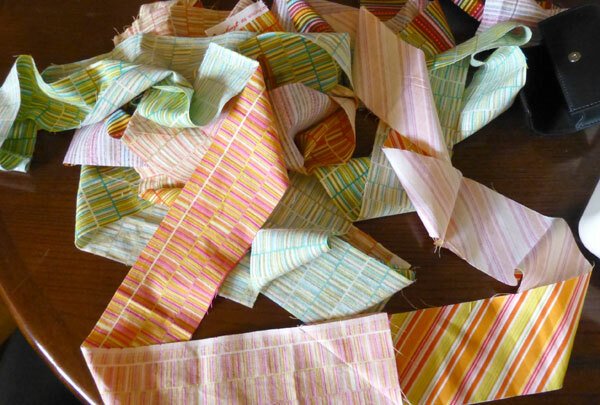 Over 9 yards of binding! 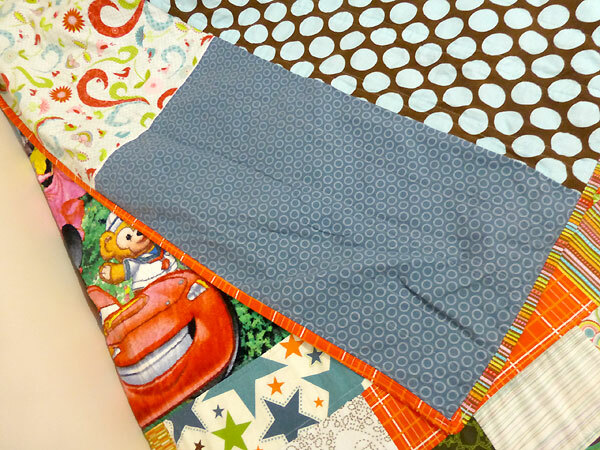 Then realized I had sewed the wrong sides together. Not happy. I spent some “quality” time unpicking that afternoon. 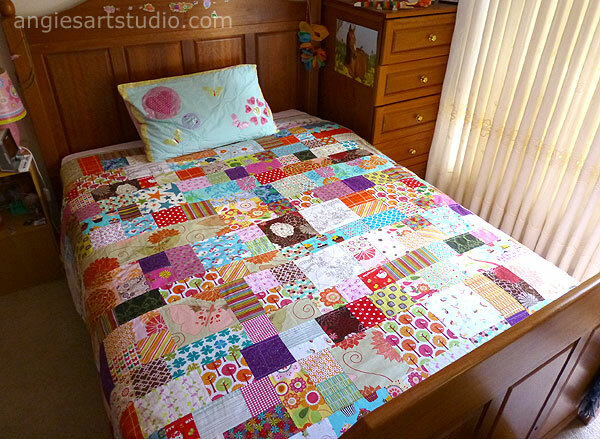 Washed and dried…wow, looks so good on the bed! For my nephew, my sister had a great idea. 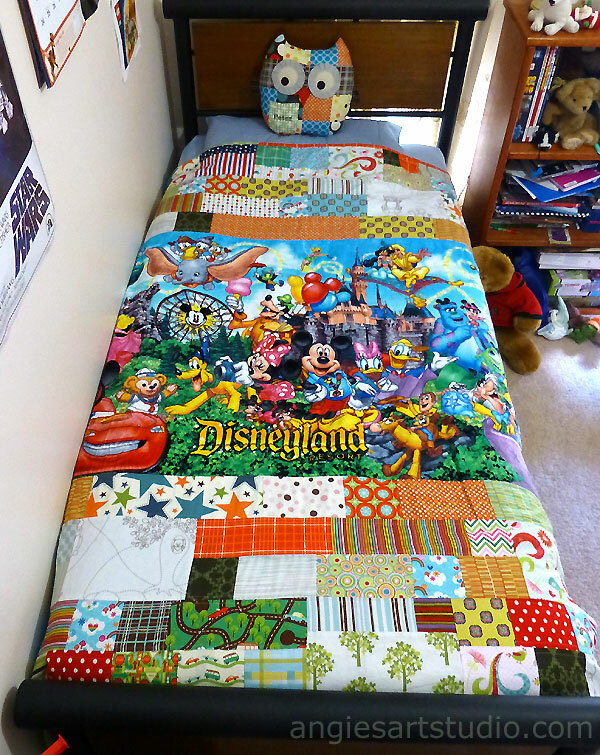 His bedspread incorporated a Disneyland towel, a souvenir they had purchased during their visit with me in California last year. 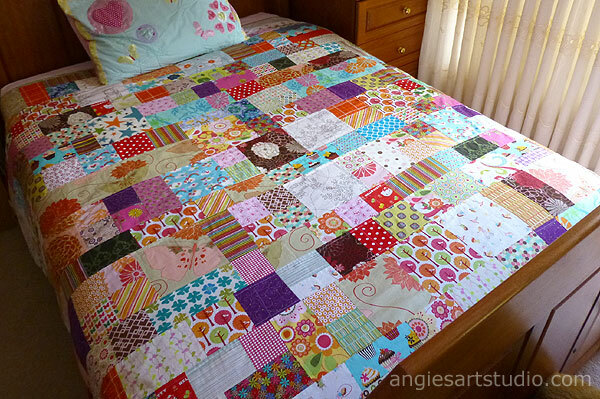 The backing is also flannel and although you can’t see it in the pictures, I quilted the two layers together with straight lines going horizontally and then vertically. 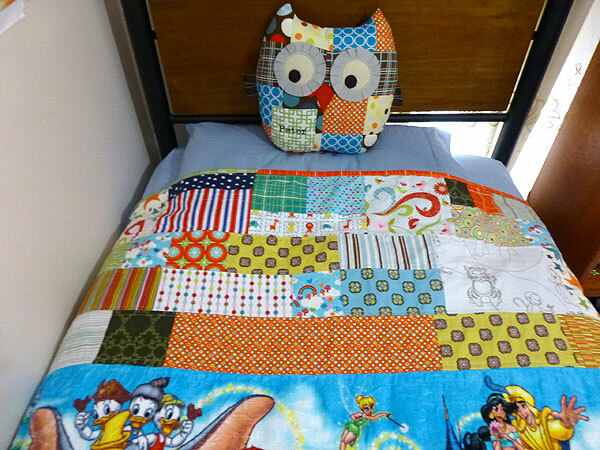 He sleeps with one of my patchwork owl pillows, matches his bedspread too! 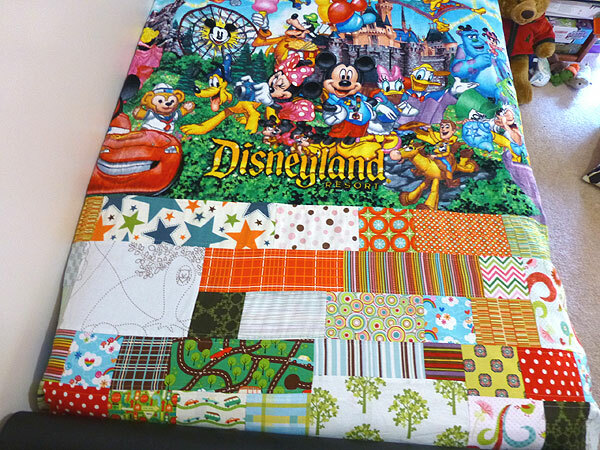 We had such a fun and fantastic time together during their visit last year and now all the magical memories of Disneyland are sewn into this bedspread. 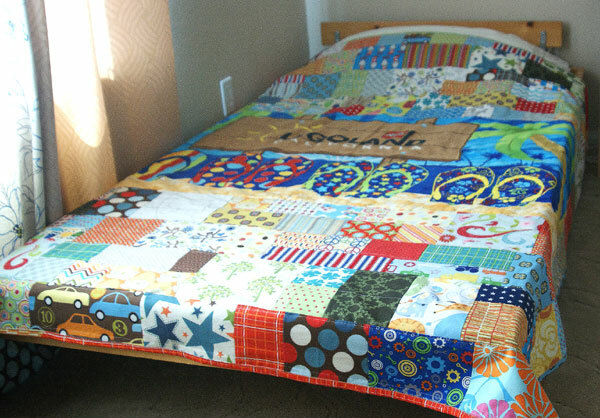 It took about 2 weeks to complete the patchwork bedspread for my niece’s double bed, and about a week to make my nephew’s twin bedspread. I love how it turned out. More importantly, my niece and nephew love it too and hopefully it will be cherished for years to come and be past down to the next generation. 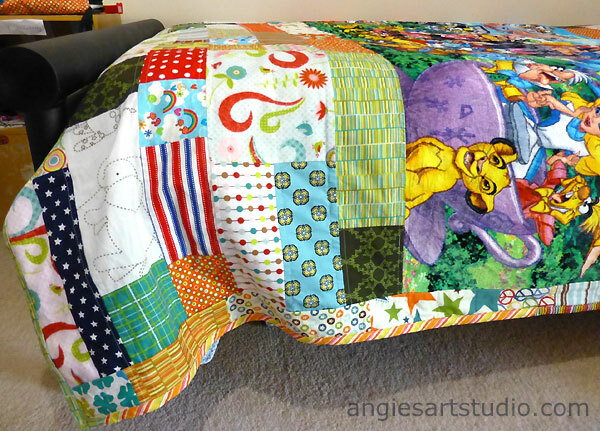 Finally, as promised, I finished making the 3rd patchwork bedspread for my nephew and just in the nick of time for the Australian winter. 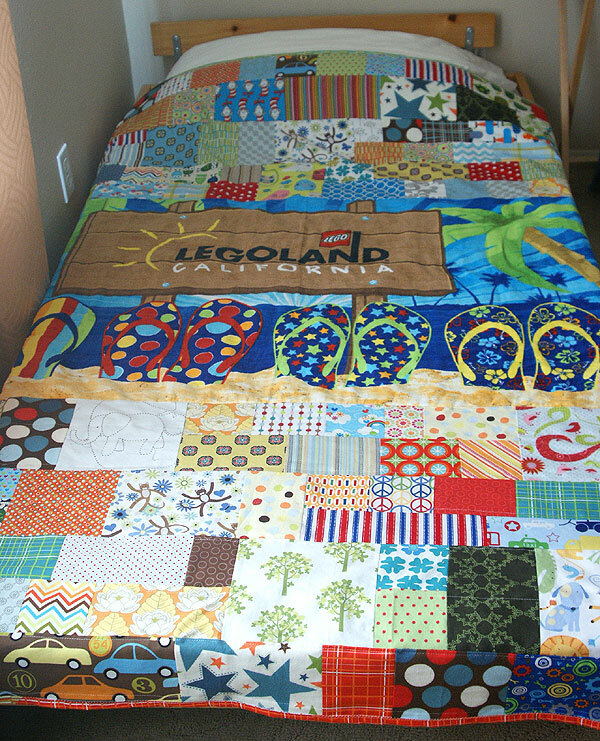 This one incorporated a beach towel from Legoland. 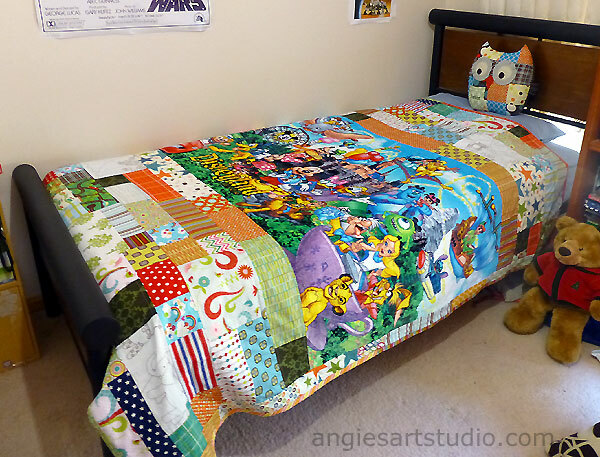 My two nephews share a room, so this patchwork bedspread will complete the look. 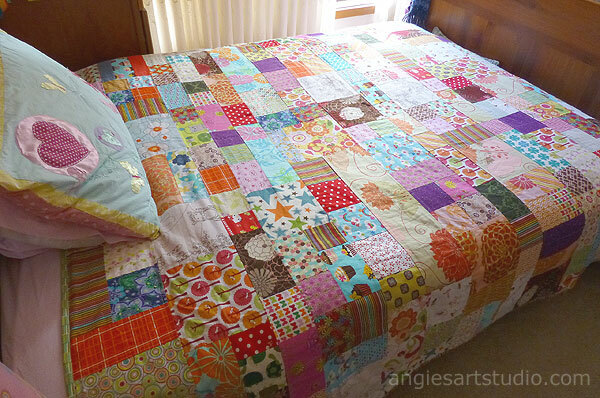 Now that I have tackled patchwork on a large scale, next up, I want to make one for our king bed!